Industry statistics show that more than 60% of enterprise resource planning (ERP) implementations fail. A quick Google search for ERP failures turns up some of the most famous names in business and government, including the US Navy, which sank $1 billion into failed ERP pilots. Knowledge Management Systems, another piece of Big Tech, are supposed to capture and make useful all of the expertise resident in organizations. But implementation is estimated to fail as much as 70% of the time, because human expertise is very hard to capture reliably in information systems. A June 2012 report from the McKinsey Global Institute estimates that business implementa-tion of social networking could contribute between $900 billion and $1.3 trillion in annual value in just four industry sectors, and enhance the productivity of high-skilled workers by 20-25%. But a February 2012 report from Altimeter concluded that most enterprise social networking implementations end up stuck in one or more significant roadblocks. Clearly, implementing a big, complex system is a job for experts. The risks are as high as the potential rewards the systems offer, and organizations have come to think long and hard about such projects before moving forward. Fortunately, there is an attractive alternative to the high-risk, high-reward approach. Instead of thinking big, think small. Instead of buying unfamiliar technology, rely on systems and tools that are already in place and that you already know how to use. Instead of investing in expensive new technology, take advantage of somebody else’s. Take for example the automation of one of the world’s most common business processes: accounts payable. 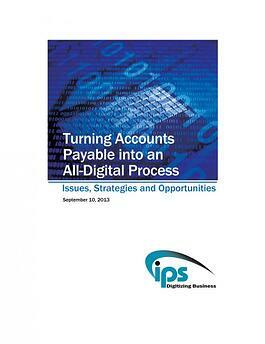 Every industry’s accounts payable process is different. Each industry purchases different products and services. They account for purchases differently and have different levels of technical sophistication in electronic billing and payments. But the headaches are the same. Accounting data is still buried in the invoice, whether it arrives by mail, email or Web download. Far too much is received on paper – as much as two-thirds in most AP departments. While it is entirely possible to make AP automation a part of a massive ERP implementation, it is much easier and, in many cases, more practical to go small. The people responsible for AP can see the same gains in efficiency and achieve cost reductions faster and with far less upfront investment using one simple tool available on every desktop in your organization: the Web browser.